More than 400 sheep are currently grazing at the San Marcos Foothills Preserve to restore habitat for a number of bird species, including grasshopper sparrows; Western meadowlarks; burrowing owls, which live in old squirrel holes; and white-tailed kites, designated a species of special concern. Once home to the greatest number of Santa Barbara County’s grasshopper sparrows, the foothills below San Marcos Pass saw the ground-nesting birds’ numbers dwindle to zero after cattle grazing ceased around 2008. Too much thatch, or fallen plant matter, had accumulated between the bunches of grass, which became thickly overrun with nonnative species like ripgut brome. Photo: Paul WellmanElihu Givertz is testing the idea that reintroduced grazing at the San Marcos Foothills Preserve will restore native grasses. Channel Islands Restoration’s Elihu Givertz, his team, and more than a thousand volunteers have been bringing native plants back to the county preserve, often through painstaking hand-planting. Now, to give native grasses a fighting chance, areas dominated by nonnatives are being munched by ewes brought in by Jenya Schneider and Jack Anderson of Cuyama Lamb LLC, which is part of Quail Springs Permaculture. Givertz called the grazing project part of a “paradigm shift” among environmentalists, who have come to recognize the value of grazing species in habitat ecosystems. For the two-year sheep study, he selected 30 zones of differing characteristics, with a few control areas that are sheep-free. The theory is that by running 400-plus sheep for a day across an acre, they’ll eat what’s there, rather than what they prefer, and trample seeds and stems underfoot and into the ground before being moved the next day to the next acre. Givertz and Mary Martin, a biologist with the U.S. Fish & Wildlife Service, exclaimed happily on Tuesday when Schneider showed them four-inch native grasses sprouting greenly in a zone the sheep had grazed only the week before. Because the roots of native grasses are much deeper than nonnatives’ — about 10 feet versus two feet — they are expected to survive the sheep incursion and come back stronger than the nonnatives. “The soil is more alive,” said Givertz, as the deeper roots support a cosmos of microorganisms, nutrients, and moisture. Photo: Jean YamamuraJenya Schneider praises her border collie after he herds the sheep from one pasture to the next. Fish & Wildlife granted $25,000 for the restoration effort, part of its Partners program with landowners to improve habitat. 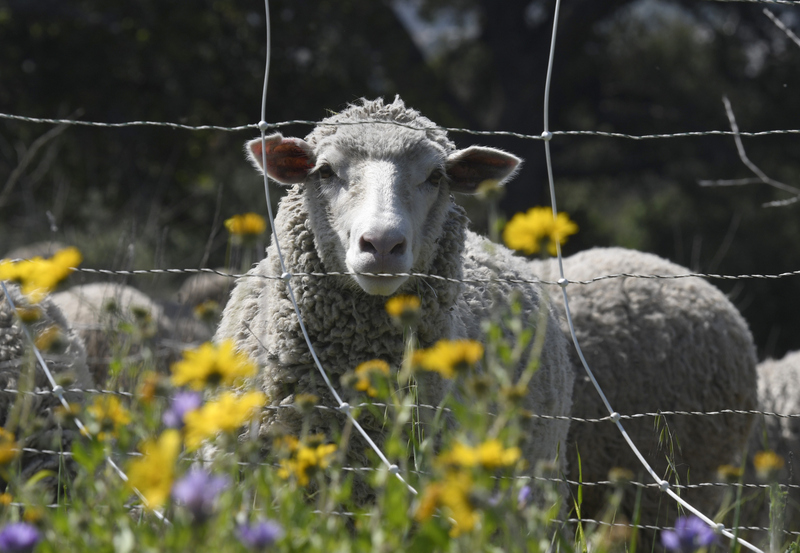 The flock of sheep is one part of Channel Islands Restoration’s plan, which includes native plantings, seed collection and propagation, monitoring, and a robust volunteer program. The County of Santa Barbara contributed another $21,000, with the remainder of the $50,000 budget coming from donations to the nonprofit Channel Islands Restoration, Givertz said, in part from REI and the coalition that established the preserve. The Rambouillet-Targhee sheep will spend about four weeks in the foothills before moving to their next assignments, an apple orchard in Cuyama and then some vineyards in late fall. They’ll be shorn of their merino-type wool soon, and many are likely to have lambs in the fall. By this time next year, Givertz hopes the cycle repeats at the San Marcos preserve, accompanied by even more birdsong. Photo: Paul WellmanPlaced in a new pasture, the sheep headed straight for an oak tree; its leaves are one of their favorite foods.